Size: 10.0" x 9.7" x 1.5"
The TI ViewScreen panel connects with a cable to the Texas Instruments Graphing calculators. Placing the panel on the overhead projector enlarges the image of the handheld screen so that each student can follow along. Don't miss the US Patent Application U.S. Pat. No. 5,168,294 with the title “Display demonstration system for providing enlarged projected image of calculator display” filed already in September 27, 1991. The TI ViewScreen 82 was introduced in 1994 and connects to the TI-82 VSC (ViewScreen Calculator). It was delivered either as the ViewScreen panel package with the power supply and a carrying case or as part of the ViewScreen system including the Graphing calculator. The Presentation Link Adapter connects the student versions of the TI-84 Plus family to the ViewScreen panel using the calculator's USB port. 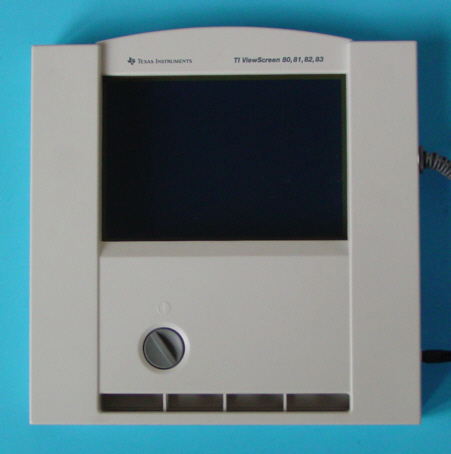 With the phase out of the overhead projectors from the daily life, Texas Instruments developed with the TI-Presenter a perfect replacement for the ViewScreen panels based on modern video technology.